the kind where you were left drowning in your own sorrow with no one to hold you or catch you as you sunk deeper into your hurt, consumed by your wound. A curdling experience one would not be able to forget. Sometimes the person is worth every tear, each wracking pain and senselessness. To savor Love, one must embrace it. To Embrace it, one must experience hurt. A heart could only love as much as it could hurt. 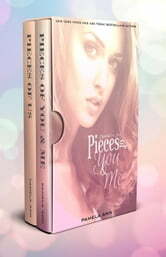 This Duet Set contains Pieces of You & Me and Pieces of Us. Approximately 552 pages. There's a time in life where you need to be selfish. Knowing that whichever path you choose, someone will end up hurting. I'm stuck with this predicament. Am I selfish enough not to care? Or am I selfless enough to sacrifice my own happiness? Hurting the only man that had me--body and soul.